One of the most common reasons for this phenomenon have kids in the first weeks of life is the obstruction of the tear ducts. While in the womb the child the outlet of the lacrimal-nasal duct is closed by a thin gelatinous film that when the light burst. If this does not happen, and the film is retained patency of the lacrimal drainage system is broken, starting to accumulate tears. Another reason for slezotechenii eye in newborns can be conjunctivitis. This disease in infants is quite rare, but if it appears, then, most likely, the infection passed during childbirth when the baby passed through the birth canal. In bacterial conjunctivitis the eyes conceive sour and often after awakening because of the accumulated sticky secretions to open them is impossible. In addition to bacteria, the occurrence of this disease can cause viruses and allergies. In viral conjunctivitis, copious lachrymal secretions combined with eyelid edema. The child may be a burning sensation in the diseased eye, also appears sensitive to sunlight, he becomes Moody and whiny. Conjunctivitis allergic nature is expressed by the swelling of the eyelids, increased lacrimation of the eyes as well as pronounced itching. This disease can be triggered by household chemicals or pet dander. Also, watery eyes can occur when the usual catarrhal disease, as one of the manifested symptoms of the disease. However, it is easy to distinguish from other diseases because it often is accompanied by painful sensations in the throat, sneezing, runny nose and nasal congestion. 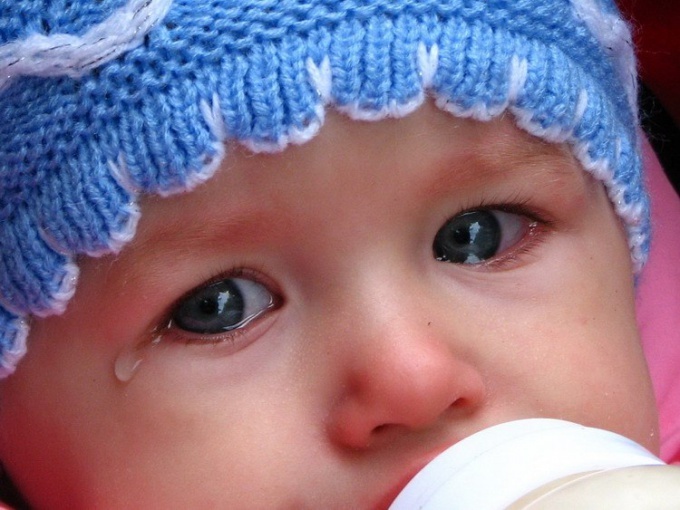 In addition, the appearance of tears in infants can be caused by a foreign object caught in the eye, or trauma that the child can apply themselves. If you notice that the newborn crumbs watering one or both eyes, an urgent need to see a pediatric ophthalmologist. Only a specialist can identify the true cause of such manifestations and to assign appropriate treatment. In the best case – this can be either a simple rinsing or massage, and at worst – more radical measures, namely, the probing of the lacrimal-nasal channel.